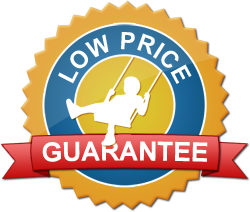 We guarantee the lowest prices, or we'll beat the competition price by 10% of the difference! Shop with confidence at SwingSetMall.com, that not only are we going to provide you with the largest selection of quality swing set parts online, excellent customer service, but also the lowest prices – guaranteed. If you find a currently offered lower total price (including shipping/handling, sales tax, etc.) on your complete order at any online competitor within 30 days of your purchase, we invite you to submit the Low Price Guarantee Request form below. Once verified, we will not only match the price but also provide you with a 10% refund of the difference! The guarantee applies to the total cost of your complete order including shipping/handling, sales tax, and any other fees. The total price including shipping/handling cost, taxes, etc must be verifiable online at the competitors' website(s). If the price you have found elsewhere is lower than our cost (including item cost, shipping, and merchant processing fees), we reserve the right to revoke the guarantee. However, if we do so, we will – on request – provide proof that the price is below our cost.